Hi. 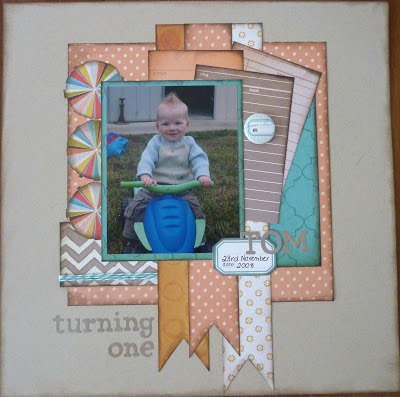 Today I would like to share with you my LO for the October Sketch Challenge over at My Creative Sketches. It is a photo I absolutely adore of my middle son Tom on his first birthday. (He is about to turn 5!!). I have used papers from Studio Calico's Yearbook range. They are lovely and soft colours that really compliment the photo. Hi Nelle, this is really lovely! the colors are wonderful and the photo is so cute, and I love the banners coming out under the photo.. love the layers under the photo too.. beautiful layout! what a fun take on the sketch! love the banners! Thanks for playing along with us at My Creative Sketches! Great take on the sketch! Love the colors, and that's a great photo of your son - I love his haircut! Thanks for playing along! Love your take on the sketch! I live how you inked the edges of the papers as it really makes them stand out! Thanks for playing along!